Smokey Jade adopted 12/17/04. 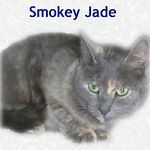 Smokey Jade has lovely green eyes that will melt your heart. She was having litter after litter without a home to call her own. Loved by an 11 year old girl that couldn't keep her but cared enough to contact Feline Friends.